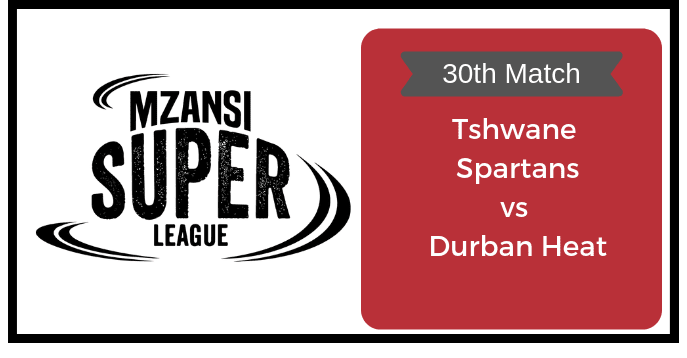 Today Match Prediction of Tshwane Spartans vs Durban Heat, 30th Match T20 Preview, Playing 11, Injury Updates, News and Dream11 Prediction. The bottom placeholder of Mzansi Super League 2018 will take on each other. Can TST defeat DUR today? Let us find. If you are looking for DUR vs TST Dream11 Prediction then you are are the right place. Tshwane Spartans are all set to take on Durban Heat on Wednesday, December 12, 2018, at SuperSport Park, Centurion. In Today’s Dream11 Fantasy Cricket Match of TST vs DUR, we will cover Pitch Report of SuperSport Park, Centurion, Predicted Playing 11, Toss Prediction, and Fantasy Cricket News and Tips. You May like to Read IN-U23 vs PK-U23 Dream11 Prediction. Who Will Win the Match Between DUR vs TST and Toss Prediction? Tshwane Spartans and Durban Heat, both the teams are in the bottom of the points table. 30th match is the last match of the league stage and both the teams are left with no option other than to play for the pride and finish the campaign with a winning note. Tshwane Spartans have played 9 matches, won 4 and lost five matches. They are in the fifth position of the points table with 16 points in their pocket. Gihahn Cloete is one of the most valuable players of TST. He has contributed 275 fantasy points so far and performed consistently throughout the MSL 2018. Durban Heat has played 9 games, won 2 and lost 6 games. They are at the bottom of the points table with 10 points in their wallet. Morne van Wyk is the key player of DUR. He has contributed 162 fantasy points so far. The last time when Tshwane Spartans and Durban Heat met each other. DUR has defeated TST by 10 runs. Durban Heat needed 129 runs and they have chased the score. GL Cloete has scored 55 runs off 43 balls and the rest of the TST team players failed to contribute. Almost all the batsmen fro DUR side have contributed with the bat to chase 120 runs. JA Morkel has scored 26 runs which was the highest score among all the players of Durban. Gihahn Cloete, AB de Villiers, Eoin Morgan, Dean Elgar, Lutho Sipamla and Shaun von Berg are the key players of Tshwane Spartans Team. Gihahn Cloete, AB de Villiers and Dean Elgar will lead the batting department. Lutho Sipamla, Shaun von Berg and Robbie Frylinck will lead the bowling department. The Spartans can make a couple of changes as they have nothing to lose. Batsmen: AB de Villiers, Dean Elgar, Eoin Morgan, Tony de Zorzi, Andrea Agathangelou. All-Rounder: Jeevan Mendis, Robbie Frylinck. Bowlers: Lutho Sipamla, Andrew Birch, Shaun von Berg. AB de Villiers (c), Tony de Zorzi, Sean Williams, Gihahn Cloete (wk), Eoin Morgan, Corbin Bosch, Rory Kleinveldt, Robbie Frylinck, Dean Elgar, Andrea Agathangelou, Rilee Rossouw, Shaun von Berg, Jeevan Mendis, Eldred Hawken, Andrew Birch, Lutho Sipamla, Sikandar Raza. Morne van Wyk, Khaya Zondo, David Miller, Sarel Erwee, Albie Morkel, Kyle Abbott and Keshav Maharaj are the key players of Durban Heat. Albie Morkel will lead the DUR Team. Morne van Wyk, Khaya Zondo and David Miller will lead the batting department. Kyle Abbott, Keshav Maharaj and Marchant de Lange will lead the bowling department. Morne van Wyk is the most valuable player of Durban Team. DUR may play with the same playing 11. Batsmen: Khaya Zondo, Hashim Amla, David Miller, Heinrich Klaasen, Sarel Erwee. All-Rounders: Rashid Khan, Albie Morkel. Bowlers: Kyle Abbott, Keshav Maharaj, Marchant de Lange. Keshav Maharaj(c), Hashim Amla, Prenelan Subrayen, Sarel Erwee, Vernon Philander, Morne van Wyk(w), Heinrich Klaasen, Khaya Zondo, Marchant de Lange, David Miller, Albie Morkel, Brandon Mavuta, Tladi Bokako, Okuhle Cele, Rashid Khan, Temba Bavuma, Kyle Abbott. The last time when DUR and TST faced each other, Durban Heat has defeated Tshwane Spartans. According to crix11 astrology prediction, TST will win the match today. TST will win the toss and ask DUR to bat first. The match will be played on the 12th December 2018 (Wednesday). Match Mzansi Super League 2018, TS vs DH, 30th Match. The pitch of SuperSport Park will favour the bowlers especially the spinners will take maximum benefit from the pitch. The batsmen can only score big runs if they manage to handle the initial seam and movement. Dream11 Fantasy Cricket Tips: Try to take top-order batsmen in your teams and spinners. The weather is predicted to be mostly sunny in the morning and it will remain the same throughout the day. The sky will be clear and there is no sign of rain today. The temperature is 26-Degree Celsius and the humidity to be 35%, which may go up to 48%. DUR vs TST Dream11 Tip of the Match: Make a team in which you take four bowlers, three all-rounders and three middle order batsmen. This is it for Today’s DUR vs TST Dream11 Fantasy Cricket Match Prediction of 30th T20 of Mzansi Super League 2018. Read the complete post and win in any fantasy cricket league. Leave a comment below and share the post so that others can also find Crix11 which is the best fantasy cricket prediction site. Don’t forget all the information on this website is absolutely free and if you utilize the data correctly your winning chances is 100% sure.